Unwritten rule #15. Under no circumstances are you to ever try to injure an opponent. No matter what has happened, NOTHING is worth jeopardizing another player's career. This goes without saying. It didn’t necessarily stop Rob Dibble, of course, or the occasional lunatic who brought a gun into the clubhouse, but those guys weren’t the norm. Unwritten rule #16. Honor other's superstitions. Do not mess with peoples superstitions. You don't have to agree with them but don't mess with them. Unwritten rule #17. Do not play catch on the infield, any part of it. Warmups or catch is done in the OF or near the dugout. This one is truly unwritten. You will never hear it discussed but all baseball people know it. This one is true all the way down to travel ball. Warmups for tournament games can only take place on the sideline or in the outfield. If there’s a reason for this beyond keeping the dirt pristine till first pitch, I have no idea what it is. Unwritten rule #18. In an earlier rule, I said stealing signs was allowed. BUT. Do not peek in to the catcher's signs if you are hitting. Do not even try to see where he is set up. This will result in an immediate HBP. Peeking = bad. Alex Rodriguez liked to do this. Do not imitate Alex Rodriguez. Unwritten rule #19. Always take a strike in the 9th inning until the tying run comes to the plate. I hate seeing a guy trying to hit a 5 run HR on the first pitch. Unwritten rule #20. There is no stealing on 3-0 counts. I didn't know this one but Verlander says it's a rule, so it's a rule. Unwritten rule #20(a): Do whatever Verlander says. Unwritten rule #21. Rookies are to be seen, not heard. This game owes you nothing. Don't act like you've been there cuz you haven't. No one is entitled to be a Big Leaguer. For generations, veterans used this one to put any big-mouthed rookie in his place. “[Veterans] wouldn’t even speak to you,” said Lefty Grove about his own rookie experience, in Baseball When The Grass Was Real. “They figured you were coming there to take away somebody’s job. I was there about two weeks before they let on they knew I was around—and I’d already won three or four games by then. Oh, boy.” Part of it had to do with earning one’s place in the clubhouse, but part of it was strictly pragmatic: Guys with little life experience are better off absorbing what they can than trying to impart semi-formed opinions. Now that rookies earn more money than some veterans via outlandish signing bonuses , however, and can possess significant star power before ever playing an inning of big league ball, Rule No. 21 is not nearly as germane as it once was. Unwritten rule #22. Rookies don't pay for anything. No one wants to hear them but like them or not, some vet took care of you. Pass it on. This is true for meals, for wardrobes, for nights on the town. When catcher Bill Schroeder was a rookie with the Brewers in 1983, he ended up in the hotel bar after a game in Kansas City. The veterans in the room wouldn’t let him pay for a drink all night, so in a token of appreciation, he approached a waitress toward the end of the evening and ordered a reciprocal round for them. Mike Caldwell stood up, asked who had purchased the drinks, and jumped into action. “Caldwell came over to me, and brought all six beers with him,” recalled Schroeder. “He said, ‘You’re not leaving here until you drink all these beers, and don’t you ever pull your wallet out again this year. You are not to buy another beer this season. You’re a rookie, and that’s our job.’ ” Yes, Schroeder finished the beers. No, he didn’t buy another round until 1984. Unwritten rule #23. As a pitcher that is getting pulled from the game, always HAND the ball to your manager while you wait for him ON the mound. Unwritten rule #24. As a coach that has to cross the field to get to his coaches box, please don't run across the field to get to your position. Run behind the catcher and umpire. And DON'T hold up the inning because you're late. Hitters going to the batter’s box on the opposite side of the field from their dugout must similarly circle behind the catcher and umpire. The path between pitcher and catcher is sacrosanct territory. Unwritten rule #25. From Tim Leary. Don't not swing so hard that you fall down (literally) or fall across home plate. Especially true with a 3-0 count during a blowout. Unwritten rule #26. This might be the last one. Do not look at the umpire for an explanation of a ball or strike. Bad things happen, man. Bad things. It goes without saying that the most effective method of communication between batter an umpire (or between catcher and umpire) occurs while the player in question is facing away from the ump, toward the field, in a low-key conversation that goes largely undetected save for those in the immediate vicinity. Umpires who feel shown up in front of a stadium full of people are less likely to be flexible in their opinions about a given subject. Unwritten rule #27. (This has been heavily suggested) Do not step on the chalk. You will see all kinds of non chalk steppers; the stride overs, the hop overs and the defiers. The Defiers step on the chalk just to freak everyone out. Unwritten rule #28. I found another one. No matter how bad you pitched, a pitcher MUST stay in the dugout until the inning ends. You have to wait to snap. This is along the same lines as a pitcher waiting for his manager on the mound. You got your team into this mess; it’s the least you can do to stick around until one of your teammates gets you out of it. Unwritten rule #29. Respect the game. Respect your elders. Respect your coaches. Respect your opponents. Bottom line is, this game has been played for 140 years (Let that sink in). The game will be played with or w/out you tomorrow. Unwritten rules are done. I have no more. Hope everyone enjoyed them. Despite some people thinking I did this to be relevant, I did this to share my love of the game. Here’s to you, Gregg. Nice work. I’ve referenced 2017’s World Baseball Classic twice in posts this season, and it’s only April. Today is the third—and most pertinent. Francisco Lindor hit a home run yesterday, then effectively paraded his way around the bases, skipping, waving his arms and inciting the crowd. Afterward, he publicly apologized for potentially offensive behavior. As with most things, details matter. The WBC was terrific because it showed us a Puerto Rico national squad that was unafraid, within the context of the way baseball is played on the island (and throughout much of Central America), to show some emotion on the field. Though the occasional American red-assed stick-in-the-mud took issue with this, it was generally seen as a good thing. Lindor was on that Puerto Rico team. Last night’s game was held in Puerto Rico, against the Twins at San Juan’s Hiram Bithorn Stadium. That Cleveland was playing the Twins was unfortunate, given Minnesota’s collective, ludicrous, unwritten-rules-inspired groan at a perfectly reasonable bunt earlier in the season. If any team would take issue with a hometown kid playing by hometown rules after succeeding in front of his hometown fans, it’d be these guys, right? As it turns out: not so much. Credit to Lindor for sensitivity with this issue, and relieved acknowledgement that everybody involved seemed content to let him have this particular moment. Update, 4-18: The Twins agree: Lindor was a-ok. They aren't lame, they are framework for keeping the game disciplined. Olson has, over the ensuing two weeks, backed up his position by listing 14 unwritten rules, all of them presented here with annotations. All are valid, though some have faded a bit since Olson’s time. As promised. Unwritten baseball rule #1. There is no bunting for a hit in the 9th inning (only 9th). If the shift is deployed, then this rule is void. The quibble I have here is that there’s a far more prominent exception to this rule than the shift: If the score is close and a player can reach base via a bunt, all is kosher at any time. Victories trump Code, always. Unwritten baseball rule #2. Thou shall not say "No hitter" in the midst of a no hitter. Really becomes taboo after the 5th inn., when you start to see teammates avoiding said pitcher like the plague. Superstition will never be defeated. Unwritten baseball rule #3. If you hit one of mine, I hit an equal or greater one of yours. See Exodus 21:23-24. Outmoded these days. While still sometimes in play, it was once unequivocally true. Unwritten baseball rule #4. Unless you are the pitcher, do not set foot on the mound. Yes! When Alex Rodriguez did this to Dallas Braden back in 2010, the general response was bewilderment about why Braden was so upset. Had people spoken to more pitchers, they would have heard more responses like Olson’s. Unwritten baseball rule #5. Do not make the first or third out at 3rd. Yer already in scoring position, don't be greedy. This is true, but in my book it’s more about baseball strategy than moral standards. Unwritten rule #6 ( pertains to how to handle being the victim of rule #3). If you are hit intentionally, after your pitcher hit 1 of theirs OR you have an idiot who showboats a HR, don't start a fight. Just run down to 1st base, take 1 for the team. See Matthew 5:38-42. Scott Ledbetter: This is MLB players taking exception to every little thing. My opinion, this is what happens when players embrace too much emotion. I agree the pitch on Margot, while injury producing, was not deliberate. I’ve seen plenty of batters get injured by a HBP that didn’t garner any retaliation, why did this one? Did anyone retaliate when Randy Johnson delivered an inside fastball to JT Snows face? Did anyone retaliate when Giancarlo Stanton took an errant pitch to his face? The Baseball Codes: One thing worth exploring is the idea about WHY players are more sensitive now. The dissolution of the Code — the slipping grip it has over the way the game is played – – no doubt plays a part. The less clearly that players understand the scope that defines what is happening, the more likely they’ll react to it emotionally. Scott Ledbetter: I think that’s a sign of the times… younger generations seems to be more sensitive in general, and that can carry over into all sports, not just baseball. The Baseball Codes: I agree, but I’m talking about something different — a disconnection with the meaning behind certain established behavior, which leaves them with nothing but emotion (or, as you say, sensitivity) to govern their response. Scott Ledbetter: I think I see what you mean. A lot of the younger players don’t seem to understand that some of the unwritten rules were responses to actual intent to harm other players, and it was the intent that determined how one responded. Nowadays, it’s seems like players feel the response is second nature because they forgot to understand the intent. Unwritten rule #7. Do not run up the score on an opponent. This means halting all stolen bases, it does not mean to stop hitting/pitching/playing defense. "Calling off the dogs" happens at the manager's discretion. EVERYONE has a different threshold. Boy howdy does everyone have a different threshold. Once, a four-run lead after six was considered significant. Now, some managers consider a six-run lead in the eighth as still within striking distance. This rule came into play with the aforementioned bunting-into-the-shift imbroglio, wherein the Twins expected Baltimore to transition into blowout mode (identified above by Olson as halting all stolen bases, but also including bunts, hit-and-runs, etc.) when they weren’t doing so themselves, defensively. Unwritten rule #8. Stealing signs is OK, just don't get caught. Some books say sign stealing is taboo but it's not. If your signs are easy enuf to steal, it's YOUR fault. If you get caught sign stealing, someone gets hit. If you get caught, it's YOUR fault. Absolutely correct, with the addendum that if you ARE caught, knock it off for a little while. Unwritten rule #9. Do NOT stand in the home plate circle (Dirt area surrounding home plate) when a pitcher is warming up! Do not even get w/in 10 feet of said circle. You may get hit during warmups if you are on the dirt (it's a free shot). I will never question a pitcher about this one. Unwritten rule #10. Nothing that happens in the clubhouse, leaves the clubhouse. These signs are posted in every clubhouse. "What you see here, what you hear here, what happens here, STAYS HERE!" This rule can make it very difficult for friendly neighborhood reporters to do their job. I hate Rule #10. Unwritten rule #11. Do not show up the other team or a player. This means admiring HR's, doing happy dances after K's. "Act like you've done it before". This one is steadily changing—what’s considered to be showing up another team today is far less stringent than it was during Olson’s time. Only yesterday we talked about this as pertains to Javy Baez. Unwritten rule #12. If your pitcher gives up a bomb (long HR), make an effort to appear like you are trying to chase it down. Don't just stand there and watch it fly over your head. Thought of this as I watched Puig last night. This makes sense. But if a pitcher gives up a hefty enough blast, he has far more important things to worry about than the fact that his outfielder made no effort to reach a ball that ended up in the third deck. Unwritten rule #13. Don't touch other people's stuff. Do not try on someone else's glove. Do not mess with people's personal clothes, game spikes etc. I just covered this one in March, in my Rusty Staub memorial post. Unwritten rule #14. Do not eat or drink (alcohol) during the game. The alcohol part seems obvious. That's a big NO-NO. Don't eat during the game – take care of your business before the game. No one wants to see you eating a sandwich in the 5th inn (snacks OK). I haven’t heard too much about this one, save for the instances when substance abuse is impacting a player’s performance. Gregg, if you end up reading this, I’d love to hear a story about the response to somebody bringing a sandwich or etc. into the dugout during a game. Seeing as his last post came only yesterday, give Olson a follow. One never knows when #15 might drop. Update, 5-17-18: Olson’s been busy listing more rules. Position yourself for a moment as an old-school curmudgeon when it comes to baseball’s unwritten rules, a defender of decorum, issuing proclamations about how it was better back before the current generation took over and started flipping bats all over the field and celebrating June victories like they’d just won the World Series. I actually think players being more demonstrative on the field is a good thing for the game. I think it’s exciting. It came during a media conference on Saturday and was easy to miss, being sandwiched between questions about minority representation in the sport and replay implementation. It seems, however, noteworthy. Is baseball’s head honcho actually advocating for more showboating within the sport? Overall, baseball has always had unwritten rules that kind of govern what’s appropriate and what’s not appropriate. The way I think about the changes we’ve seen in the last couple of years, is that we have a really exciting new, young generation in the game. And just like the players 20 years ago, they are going to develop a set of unwritten rules as to what’s acceptable and what’s not. Yep, it’s possible to walk both sides of the line without being in the least bit hypocritical. Manfred is absolutely correct in leaving it up to the players to determine what is appropriate and what is not. That’s been the rule since forever, and things have seemed to work out pretty well. Once, an act like digging into the batter’s box was considered retaliation-worthy. Then times changed. Now, bat flips are all but ignored, and occasionally encouraged. Because that’s the way the players (certain among their ranks—*cough, Bumgarner, cough*—excepted) want it. It’s the very position I’ve advocated in this space from my very first blog post. My own feelings have little sway in whatever position I happen to be examining. The issue at question is about how a player’s actions mesh with the mores established by his peer group at large. If he’s in the mainstream, there should be little problem with whatever it is he’s done. Otherwise, let’s discuss it and, if need be, discuss it again. Honestly, no answer he could give to any question would convince me of his competence more than that one. At their core, the unwritten rules are about respect, and however the current crop of players ends up getting there is far less important than their getting there at all. Ultimately, that’s all any defender of the sport’s code should care about. Manfred is about two years into his tenure; looks like we’re in good hands, baseball fans. In a note only tangentially related to baseball’s Code, it seems fitting to recall Jose Fernandez, as so many have done over the last day or so, as a man whose passions ran deep. His joyful embrace of the game accentuated the drama of his arrival in this country, and his enthusiastic approach had the baseball world remembering him as one of the sport’s most exciting players. In addition to all that’s been said since news of his passing broke, I have only to add that for all the kid’s bravado, he offered up the single best response to his own breach of baseball etiquette that I have seen since I began covering this beat. In 2013, when Fernandez was a 21-year-old rookie, he behaved so egregiously in a game against Atlanta that he nearly came to blows with Braves catcher Brian McCann. I went into detail about it at the time, but the important point is what came afterward: Before players had so much as settled into the postgame clubhouse, Fernandez owned up to his mistakes, apologized and vowed to do better. It was a refreshing dose of self-awareness and humility, the likes of which are seen all too infrequently in professional sports. For it to come from a kid who’d barely reached drinking age made it all the more impressive. They say, with good reason, that athletes frequently serve as poor role models. On that day in 2013, however, Jose Fernandez set as good an example as possible about how to own your mistakes, and what can be done to try and make things better. He will be missed, for his baseball skills and so much more. What the Hell is Wrong With Craig Counsell? At one end of baseball’s unwritten-rules spectrum, angry pitchers try to justify their desire to throw baseballs at hitters. At the other end, celebration-minded batters ignore the Code entirely while seeing how high they can flip their bats. On Friday, Brewers manager Craig Counsell broke new ground among their ranks, and not in a good way. Start with the details. In a game against Arizona, Milwaukee second baseman Orlando Arcia, making only his third major league appearance, collected his first hit as a big leaguer—an RBI single to right field. So far, so good. When the ball was returned to the infield, however, Arcia’s counterpart, D’Backs second baseman Jean Segura—the man who Milwaukee traded in January, in part to clear space for Arcia—took note of the moment and tossed the ball into the Brewers dugout for safekeeping. It was a nice, anticipatory gesture on behalf of a young player, and prevented the Brewers from having to waste time by halting play and requesting the ball themselves. In soccer, players’ code dictates that the ball be intentionally kicked out of bounds when an opponent goes down with a legitimate injury, nullifying an unearned extra-man advantage. In cycling, a race leader who has suffered a mechanical breakdown or other stroke of bad fortune will frequently be granted some slack by his pursuers. Yes, these things aid the opposition, but they also maintain honor. Where the hell does honor fit into Counsell’s game plan? His move was less gamesmanship—taking advantage of a chink in the system—than sheer, calorie-free bravura, emotional junk food that, while giving his team a slight advantage, diminished himself and the game at large. As a player, Counsell made something of a habit of stealing bases while his team held big leads late in games, so maybe this is just business as usual for him. Leaving the play alone—letting his ex-player, Segura, do something nice for his current one, Arcia—wouldn’t have drawn notice, because it would have been expected. By calling out a letter-of-the-law violation, however, Counsell painted himself as petty and self-involved. Ultimately, Arcia was stranded at third base, and Arizona won, 3-2, on a bases-loaded walk, in 11 innings. Could have been the baseball gods sending Counsell a message. 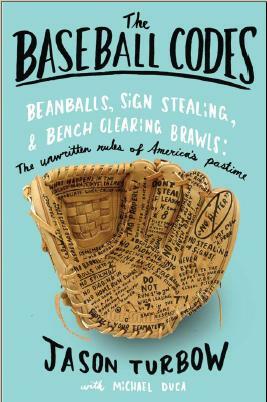 So Goose Gossage, mustached ball of old-man rage, will be passing out a book containing his version of baseball’s unwritten rules. Because, you know, people need to stay relevant. Upon hearing the news, one detail sprang immediately to mind: It’s already been written, man. It’s already been written.